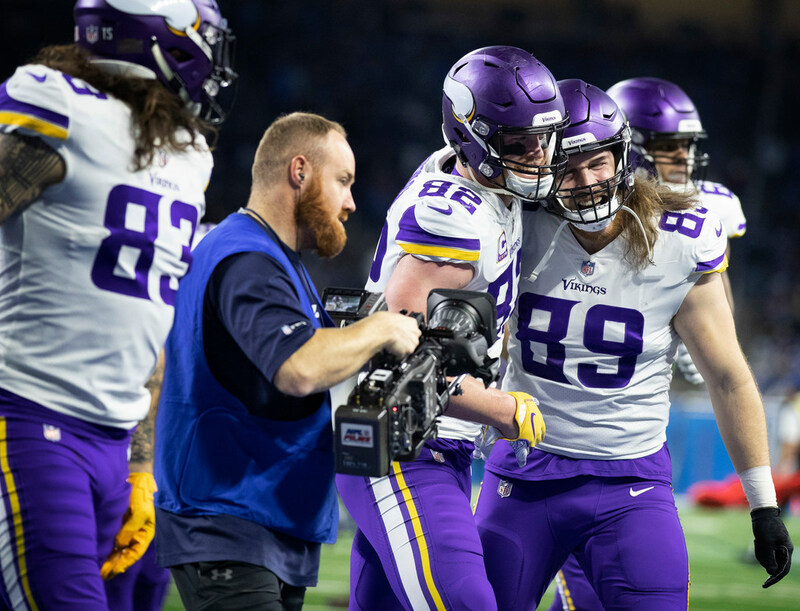 It’s become a running joke for Vikings tight end Kyle Rudolph as he has watched the front office draft a newer, younger player to his position in each of the last four years. Yet each season, Rudolph remains the room’s unquestioned leader inside the building. But as Rudolph, one of the longest-tenured Vikings players, enters his age 29 season in the final year of his contract, there remains speculation about the team’s long-term outlook at tight end. During an interview on our Access Vikings podcast, former NFL scout Dan Hatman outlined some reasons why drafting another tight end, perhaps before the fifth or sixth round this time, is a possibility. With newly-hired assistant head coach Gary Kubiak influencing the offense, more tight ends could be involved. Subscribe to, rate and review our Access Vikings podcast on iTunes. The Vikings haven’t invested a top draft pick in a tight end since selecting Rudolph in 2011’s second round. For good reasons: since he was drafted, Rudolph ranks fourth among all NFL tight ends in touchdowns (41), fifth in games started (104), 10th in receptions (386) and 12th in yardage (3,787). The top-end production is added to the team captain’s professionalism, respect in the locker room and throughout a community in which the Rudolph family donates its time and money. He’s known as the kind of person around whom you build a locker room. Still, Rudolph enters the final season of his contract facing uncertainty about his future in Minnesota, where his family calls home. Rudolph’s desire to stay with the Vikings doesn’t guarantee anything, so it’ll be interesting to see how a cap-strapped, and possibly cash-strapped, team proceeds. Urgency is additionally heightened with David Morgan, the Vikings’ No. 2 tight end and blocking specialist, also entering the final year of his contract. Behind them are talented, yet unproven, receiving threats in Tyler Conklin and Cole Hikutini.